I was so impressed with Major Organizers! Truia was an absolute lifesaver. She helped me unpack from moving, and did an absolutely outstanding job. She worked quickly and efficiently, and was such a pleasure to be around. I was able to schedule the service within a few days, and the process was easy and reasonably priced. They also helped my daughter organize her place. We both love these guys! Stacey has been fantastic! I was skeptical at first because I’ve never experienced professional organizing but the results have been impressive. Our house is coming into order and we’re learning the process so we can continue keeping things neat and tidy ourselves. Definitely recommended! I can’t thank Major Mom enough for their help in whipping our home into shape.The Moms were kind, helpful and extremely efficient in assisting me in getting rid of the “stuff” I had accumulated and no longer needed. You gals are awesome. Greenwood Village, CO. Quilter. Photographer. Mom of 2 grown kids. I was feeling frustrated because I didn’t have enough room for all my clothes/shoes. Cathy helped me find unused space and we found homes for all my shoes and clothes! I love it so much. It’s great not having anything on the floor and all my stuff is easily accessible. Plus the best part is, it looks pretty! Thank you so much! Wendy is incredible! She was lovely to be in my home. She is SO capable. She kept me on track! Wendy is so experienced and caring. She knows what needs to be done and just keeps on going. I definitely would not have been able to do this without her! I will certainly recommend your company, especially Wendy. Major Mom helped to unclog the major arteries of our home. Now it feels free-flowing and more peaceful. I am extremely relieved, and so pleased we hired Major Mom. They did an excellent job! Thank you Laurie, your ideas were brilliant. They say there’s no magical action that will make you happy; not running away, getting married, getting divorced, having a child, winning the lottery, or changing jobs. Do it, and you’ll just have a new set of problems. The only way to solve problems is to work them out and that is when I went searching to get organized and found this wonderful company called Major Mom. I am a divorced woman who returned from Arizona to my home town in Colorado to care for my elderly mother. My mother passed away (age 98)! and I was left to clear out her home. Because of emptying out her home, so many items had to be placed in my new apartment. I had boxes in my dining room that reached to the ceiling. I have a full time job, exhausted from caregiving and moving. I would return to my apartment after work and feel so depressed seeing unemptied boxes in the dining room, living room, bedroom, and garage. I was tired of eating off plastic plates and utensils since I could not find my dishes or silverware, but I had no time and I was exhausted. I thought of calling the moving company who moved me to see if they could send someone to help me. I had no idea how to find someone to help. I got on my computer and Googled “how do I get organized in Denver” and found Major Mom and wonderful Wendy Ahrens who organized me and changed my life. Wendy is a vivacious, warm, and caring person who helped me move on with my life and helped me become conscious of what works for me now that I live in a smaller place and what doesn’t work for me anymore. All decisions are totally mine and I totally love all that she did. Now I have time to honor all of my struggles and rejoice in my successes and begin a new life. It feels great and the company Major Mom helped me begin! I could not believe all that Wendy Ahrens along with her helper Ange Archuleta accomplished in such a short period of time. Wendy’s organizing is a masterpiece! I have not changed a thing nor did I have to worry about anything. Wendy, who supervised everything, had incredible ideas and she and Ange worked so hard and so fast. I am so lucky to have found them. From the first introductory meeting to the thorough follow-up after the organizing time, Major Mom was professional and easy to work with. The plan that Major Mom created after our first meeting fit me like a glove. I am very visual and have an infinity for sports and competition. Angela and her crew transformed my office environment to be fun and visually stimulating. I even have a system for my paper flow that utilizes baseball. This system has made an unbelievable difference for me and my work! I would have never imagined this was possible. Major Mom organizers know all the tricks, and I now know there is a lot to being an expert in the organizing industry. I highly recommend Major Mom for any home situation, a home-based office or even the small business office environment. They will customize the plan and execution around your needs as a client. They bring order and remove chaos or clutter. Give them a call for a meeting if you are reading this. You won’t be sorry. The pay-back afterwards will speak for itself, and you will wish you had called sooner. 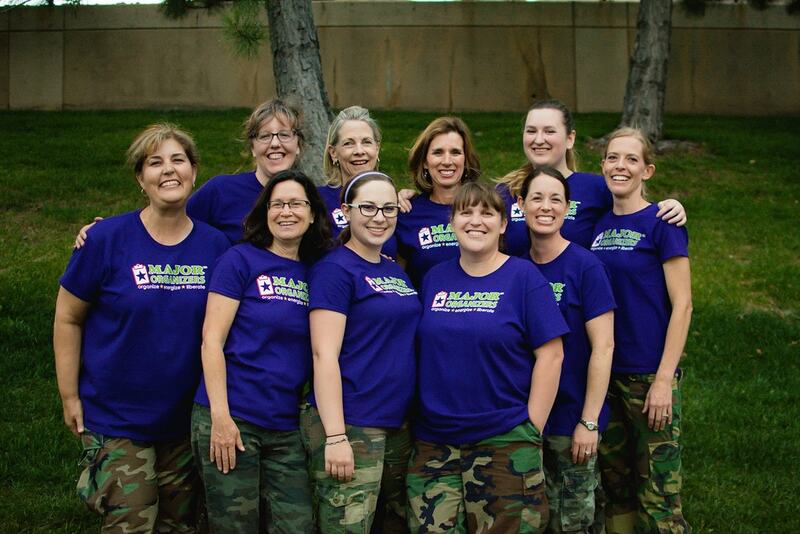 Good luck to Major Mom as they go national with this incredible process!